It is the road most traveled: You partner off. The two of you move in together, get hitched or make a Kurt-n-Goldie-style life commitment to one another. You buy some throw pillows and if you didn't already have a pet, you go and find yourself a fur baby. Maybe after the two of you have realized you're capable of caring for the fur baby, you upgrade to a human baby. When your marriage or relationship falls apart and human babies are in the picture, what comes next is a matter of custody. Sometimes it's obvious who should get custody. But when it comes to the fur baby, matters aren't always so cut and dry, not if both parties want to go to war over the woofster. In the case of pets, it's purely about property. Not all pet custody disputes involve a divorce—just as not all breakups involve the crumbling of a marriage (and we'll get to that later)—but let's start with divorce anyhow. 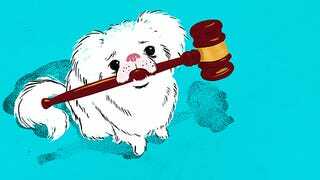 When it comes to the long arm of family law, the custody of a pet is technically no different than possession of any household object. You get the mid-century couch and coffee table, your ex takes the obnoxiously large flat-screen TV and the dog. The fact that the pet is actually a living thing isn't technically taken into consideration. Your furry friend is just another piece of property and negotiations (or, worse, litigation) may approach it as such. And in the case of property that requires more care than a coffee table, there are a few factors that are considered: Did the pet belong to one party before the relationship? Who's the pet's primary caretaker? Who pays for the vet bills? Essentially, these questions are no different than "Who uses the computer more?" or "Who paid for the blender?" The answers resolve the issue right then and there. But for couples who got the pet together and split both the cost and caretaking responsibilities, the debate goes on. Jacqueline Newman, an experienced family law attorney in Manhattan, says that when kids are involved, the decision tends to be a matter of practicality: "What we say is, 'The dog follows the kids.'" The theory is that if you're around enough to be a primary caretaker for children (and/or have the means to hire childcare because you're busy having it all), you can definitely handle a dog. For couples who share custody of their children and want the same for the dog, the dog still follows the kids, literally. "Whoever has custody of the kids for the weekend, the dog goes with," says Newman. In short: If you argue over custody of a dog like you would your children, you're going to settle like you would with children. Newman notes that pet custody battles are more heated when the couple doesn't have children (which makes sense: the fur baby often takes the place of an actual baby); about 30% of her cases fall into this category. "In situations like that, we didn't necessarily litigate, but it's just as heated as any custody case," she says. Newman recalled one particularly contentious incident where litigation over dog custody went on for "a good month." But what's a month when you're fighting for a limited lifetime of constant love and adoration from a maltipoo? The first case, the non-appellate decision, is from 2011 and involves the custody of a dog named Bubkas (which makes reading the brief very difficult because Bubkas). It's actually not a divorce case, just a matter of two exes fighting over sweet Bubkas in civil court. The court ruled that the couple would share custody, and that was the end of it. For all we've said about the law viewing pets as simply a matter of property, it's worth noting that this court appears to be ruling with the pet's quality of life in mind. Also, for a court brief, the writeup is really... sweet? Lady Justice has a soft spot, after all.